Will asks what Lou plans to do tonight once she gets home from work. Lou makes up an adventure, then admits that she will probably just finish her book. Will then asks Nathan for a ten-pound note, as he had bet Nathan earlier that Lou would be reading a book tonight instead of watching TV. Lou gets angry that they expect so little of her, and plucks the ten-pound note away from Will with a plan to go see a movie instead. She is smiling at the joke, but also oddly close to tears. Lou does not want to face the fact that her life is safe and boring. Lou’s anger that Will is making her life even more trivial by betting on it is the perfect catalyst for Lou to start taking more risks and being more adventurous. Lou still works on Will’s adventure calendar every chance she gets. She is rapidly running out of feasible ideas and is starting to feel as boring as Will and Nathan seem to think she is. After Nathan leaves, Lou tells Will how much the bet hurt her. Will responds that he wanted Lou to take a fresh look at her life. If he were in her position, he would be doing as much as humanly possible, just like he did after work before his accident. Will reminds Lou that she has just as much potential as he did and that it’s now her job to live the life that he no longer can. Lou is scared that she really will amount to nothing if she continues on in the way that her life is going so far. Though Will’s bet was insensitive, Lou needs a push to start having some real ambitions. On her own, Lou might never have forced herself to do more, but Will can help her gain the motivation necessary to live an extraordinary life. Two days later, Will gets an infection that lands him in the hospital. Lou gets some days off while Will recovers, and she spends her time in the library. She finds internet support groups for quadriplegics and their caregivers and feels endlessly comforted by the range of emotions that others talk through. Lou writes a message under the username “Busy Bee,” asking for advice on how to change Will’s mind about life as a C5-6 quadriplegic. Will’s infection is a reminder that all of Lou’s plans and Will’s hopes will always be subject to Will’s physical health. Lou starts to reach out to other people to build a support group for Will. Lou’s user name “Busy Bee” recalls the bumblebee striped tights, and shows that this effort is also a way for Lou to build a support group for herself as a caregiver. The next morning, Lou scrolls through the responses to her message. Some are not helpful, while others are not. One even questions why Lou feels the need to change Will’s mind for him at all. The suggestions continue, but the one that sticks in Lou’s mind says that Will can change his mind if he has a partner who loves him. The support groups online offer another place to explore what makes life worth living, and who gets to decide what makes life worth living. Lou’s focus on love suggests that Lou is starting to fall in love with Will. On Thursday, Lou picks Will up from the hospital. He is exhausted from the lack of sleep, and Lou’s planned adventures for the next week all go varying shades of poorly. Finally, Lou takes Will to a wine tasting where Will manages to get himself a little tipsy. On the way home, Will manages to convince Lou to stop at a tattoo parlor, despite all of Lou’s protests about Patrick’s dislike of tattoos and the chance of hepatitis from dirty needles. Will consistently pushes Lou past her comfort zone, though Lou still worries about what other people think instead of what she truly wants. Lou is also too afraid of the possible consequences of getting a tattoo to enjoy the thought of it—another example of fear getting in the way of Lou truly experiencing all life has to offer. After two hours at the tattoo parlor, Lou leaves happily with a tattoo of a little bee on her hip. Will had seemed relaxed and happy in the shop, as the tattoo artists were used to working with quadriplegic people. Lou complains about the fit that both their parents would have if they found out, and insists that Will show her the tattoo he got. On his chest is a small rectangle that reads, “Best before: 19 March 2007,” the date of Will’s accident. Will thinks it’s funny, while Lou can’t decide if the dark humor is truly amusing. Nonetheless, Will gives Lou a ten-pound note as repayment for his bet that she wouldn’t actually get a tattoo. Lou’s bee tattoo is another choice that she makes for herself instead of letting other people’s opinions dictate her life. Will also had a good experience at the tattoo shop because he was able to make his own choice, and the tattoo artists were able to look past his wheelchair to see him as a person. Yet Will’s tattoo shows that he still considers himself to be a lesser person now than he was before the accident. Mueller, Bethany. "Me Before You Chapter 15." LitCharts. LitCharts LLC, 9 Feb 2017. Web. 21 Apr 2019. Mueller, Bethany. "Me Before You Chapter 15." LitCharts LLC, February 9, 2017. 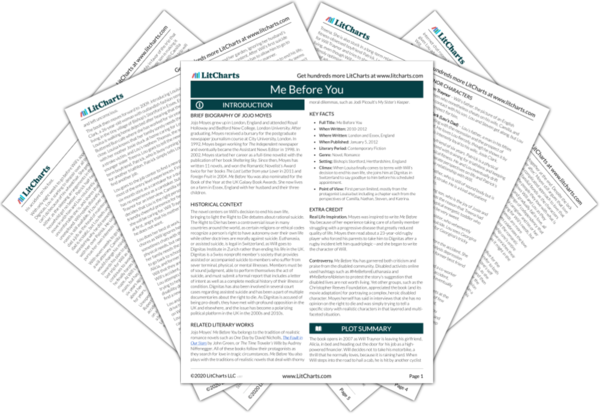 Retrieved April 21, 2019. https://www.litcharts.com/lit/me-before-you/chapter-15.